Go Ninja, go! 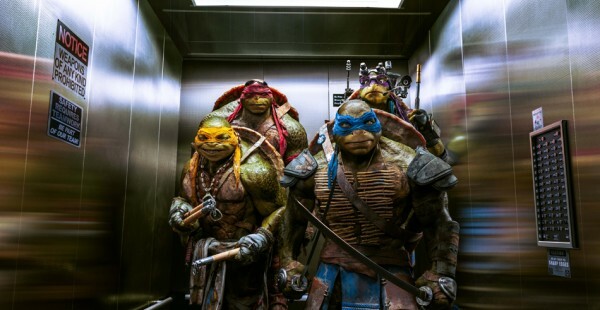 The Platinum Dunes remake of Teenage Mutant Ninja Turtles shellshocked the box office, therefore there’ll be more. To make that release date of summer 2016 in time, shooting of the sequel will officially begin next month. Megan Fox will reprise her role of April O’Neil, Will Arnett will again be her assistant Vern, and Alan Ritchson, Pete Ploszek, Jeremy Howard and Noel Fisher will probably return as Raphael, Leonardo, Donatello and Michelangelo respectively, with Johnny Knoxville again voicing Leonardo and Tony Shalhoub voicing Splinter. As for their antagonists, no word yet on whether William Fichtner, Tohoru Masamune and Minae Noji will return as Eric Sacks, Shredder and Karai respectively, even though the Shredder will obviously be in the movie. Bebop and Rocksteady have been promised for the sequel and they’ll also try to bring in Casey Jones, but don’t hold your breath for Krang and the Technodrome yet. That will probably be saved for the expected third entry, unless they already have time travel and feudal Japan in mind. By the way, did you know that fly-man Baxter Stockman was already in the first movie? He was played by an unknown and just showed up as one of Sacks’s laboratory guys, but maybe he’ll become more prominent in the sequel. Behind the lens, producers Michael Bay, Andrew Form and Brad Fuller, and screenwriters Josh Appelbaum and André Nemec all return for the sequel. There’ll be a new director, as Earth to Echo director David Green takes over for Jonathan Liebesman. If you haven’t seen his movie, it is a cute found-footage story about a bunch of kids finding a robotic alien. It’s not really recommendable for adults, but it showed that Green does have certain qualities (trailer). Speaking of certain qualities, will they be able to come up with more lines like “She’s so hot, I can feel my shell tightening” and shots like this one?